Brr! It is definitely fall in New England. Today was one of those hot chocolate (Starbucks – tall with whip) and a scarf kind of day…and I am ok with it. Fall is one of my favorite times of year. It is just a matter of weeks until my beloved Thanksgiving issue of Food Network Magazine arrives and I can officially start planning my Thanksgiving day menu. I have, of course, already started pinning things to my Thanksgiving Pinterest board. I figured today would be a good day to do the official fall/winter clothes switchover in my closet. I was sad to put the capris and maxi dresses away but happy to pull out the sweaters and scarves. And it meant that I was able to make room for the new pieces that came in yesterday in my October StitchFix delivery. 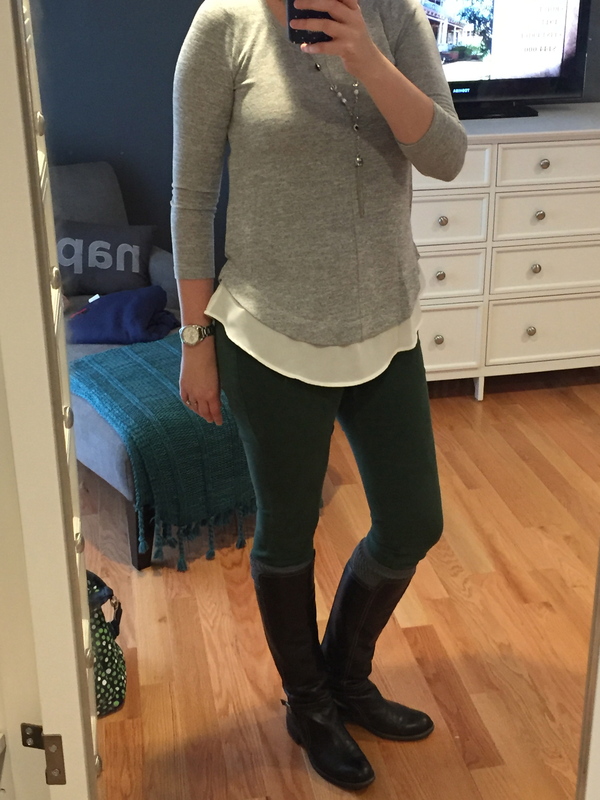 Anyone who knows me, or reads this blog, knows that I am a huge cheerleader for StitchFix. Not only is it convenient (it magically shows up at your house! ), but it helps me to step outside of my comfort zone for clothes. Each fix comes with a style card that shows me a couple different ways to wear the clothes. I make notes, in my phone, from the style cards and when I do find myself at Target (swoon, Target) or heaven forbid…the mall, I have a shopping list to follow. I have learned that it is not necessary to spend a ton of money on some of the basics, especially tanks and t-shirts. During my Target run today I found some great tank tops, 2 for $16, and some awesome boot socks that look so adorable with my skinny jeans and favorite Franco Sarto black boots. 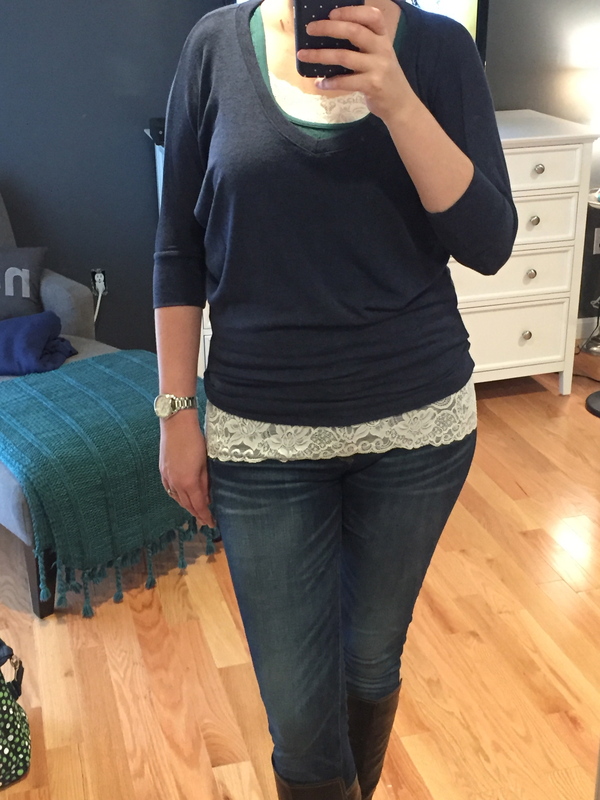 For anyone new to StitchFix, it is so important to actually try on EVERYTHING that comes in your fix. You will be surprised how some pieces look so much better on. And it is important to actually style the piece, like it shows you on the card or like your stylist suggests. I have been lucky enough to work with the same stylist each time and she rocks! Teresa, if you are reading this…thank you! If you just try the shirt on with yoga pants it is never going to look as good as trying it on with some jeans, shoes, and jewelry. Trust me on this one. Give each piece a chance. So, here is what came in this month’s fix. 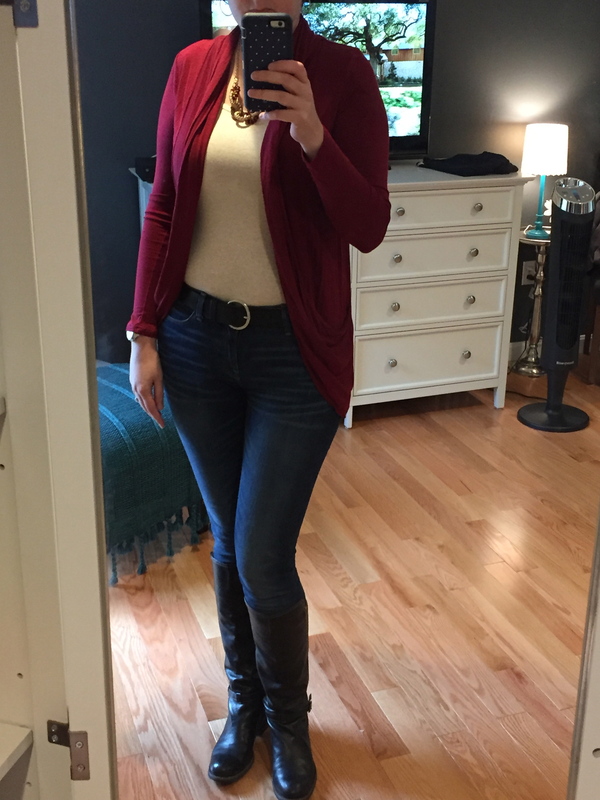 Make sure to check out the link below to a fellow blogger who has awesome StitchFix posts. I have been following Maria for awhile now and she is hosting a blog link-up so you can see even more great pieces. This cardigan is the perfect example of why it is so important to try on the piece as part of an actual outfit. When I first pulled it out of the box I was a little underwhelmed. Then I tried it on with a tank, belt and jewelry and it became a definite keeper. I tried this one on with a lace camp underneath and it gave it that little extra something-something that it needed. I really liked this top and took Teresa’s suggestion to pair it with the Giovanni Jean. They are a great forest green color that is perfect for the fall. Yes, the jeans are pricey, but because I kept all 5 pieces in this fix I was able to save 25% off the entire purchase. Whoo hoo! 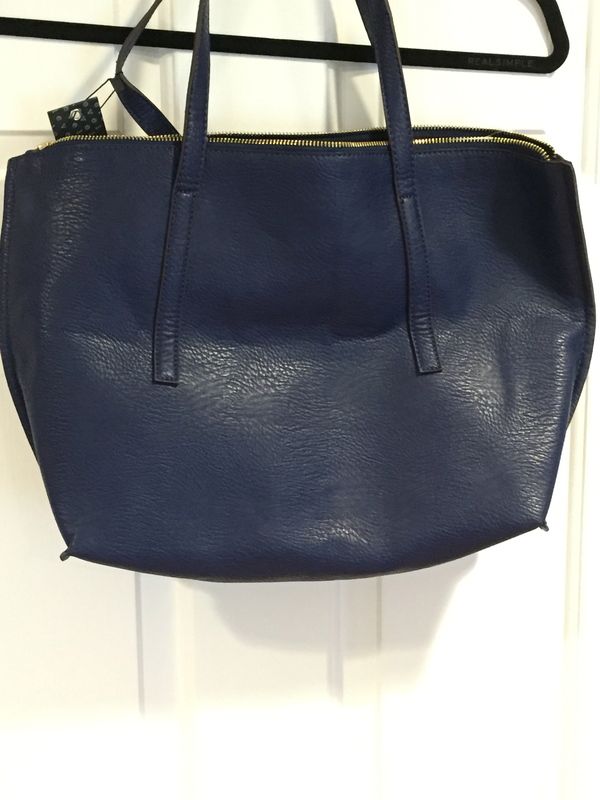 I love the navy color and this will be a great bag to bring back and forth to work. If you haven’t already, give StitchFix a try. And check out my Pinterest boards dedicated to StitchFix. This board is dedicated to items that I would like Teresa to send to me. And this board is dedicated to items that I already received. And make sure to check out Maria’s blog to see the great things she got in her fix! If you use my referral link, then I will receive a $25 credit towards my next fix. Let me know what you think about this fix or your own fix in the comments below!